The below article just published today in The Conversation. Click here to read the original. In an unusual move, Mission Australia and the Business Council of Australia recently co-authored a piece calling for a mature and open conversation about tax reform. They join a chorus of voices, from the Grattan Institute, to the CEO of PwC, to Saul Eslake, all concerned about structural problems with our taxation system. Government revenues are in trouble, in part, because of the looming end of two great economic booms. We’re all familiar with the tale of the squandered mining boom but a less familiar narrative is that of the squandered baby boom. Baby boomers are now starting to hit retirement age, striking fear into treasury and health bureaucrats worried about the spiralling costs of health-care and age pensions combined with falling tax receipts. While increased life expectancy contributes to population ageing, the primary cause in the 20th century was falling fertility rates (number of births per woman). This is important in understanding the boom. An increase in the proportion of the population that is retired (old-age dependents) occurs as a result of a decrease in the proportion of the population that are under working age (child dependents). However, there is a lag between the two which means we have an economic sweet spot that is referred to as the “demographic dividend”, where there are fewer total dependents as a proportion of the population (see the area between the dashed lines in Figure 1). This is the economic boom provided by the baby boom generation. The historically low total dependency ratio shown in Figure 1 meant that, for a 25 year period, more money was free to be used for discretionary spending and investment. This helped to propel economic growth and drove up incomes – and the effect was even more pronounced because it happened to coincide with major economic reforms. It also helped set high expectations on what the average Australian could afford to buy and the lifestyle they could afford to lead. Instead of seeing the coincidence of the height of the mining boom and the baby boom as an opportunity to save for the retirement of the baby boomers and to foster industries to shoulder the burden after the inevitable decline of the mining sector, the Howard government put in place permanent income tax cuts. These were extended under the Rudd government. Now that these temporary booms are both coming to an end, those tax cuts are really starting to bite and it is becoming increasingly difficult to adequately fund the services we’ve come to expect from a modern western economy. We are not yet entering an unprecedented level of dependency. It will take until about 2035 before we return to the dependency levels seen in the 1960s. 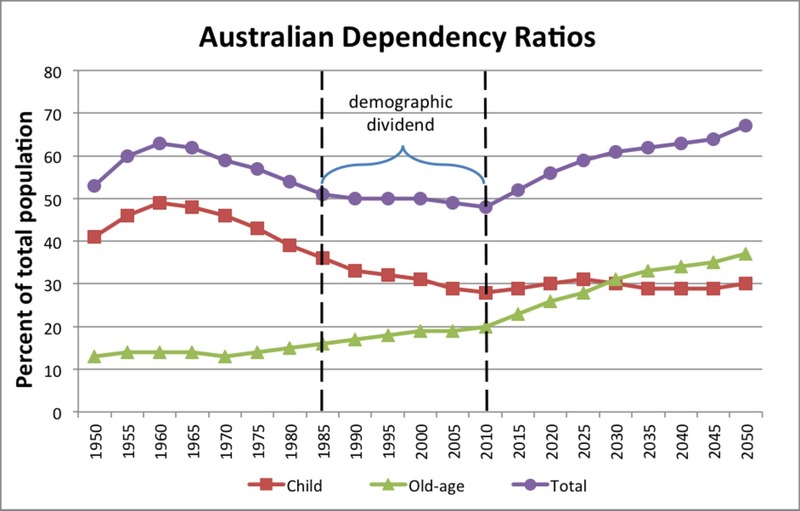 However, there is clearly a major shift from young dependents to old-age dependents. If the costs were the same and borne by the same people, there would be no problem. But many changes have occurred. The savings from the reduction in family size have been applied to discretionary consumption, including much higher expenditure per child, so the total cost of raising children has actually increased. Little is left for transfer to expenditure on aged dependents. How will we face this challenge? Will we keep the age pension down near the poverty line and continue to cut other government services in order to pay the rising total pension and healthcare costs as more and more baby boomers retire? Or will we take account of the shift in dependence we see in Figure 1, acknowledge the role that the baby boomers have played in the country’s economic prosperity over the last 50 years and provide them with a retirement income that allows them to live in dignity and with access to a few of the luxuries available to a modern developed country? Australia is a low tax country by OECD standards. 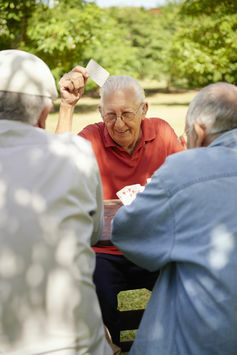 We can well afford to provide the baby boomers with a decent standard of living during their old age. But just how would we find the revenue? The possibility exists to use the end of the mining investment boom to finance the retirement of the baby boomers. The distinction between mining investment and mining production is important here. It’s not the boom in mining itself which is slowing down; it’s the mining investment boom. Many more people are employed during the establishment of new mines than are employed running the mines once they are in production phase. 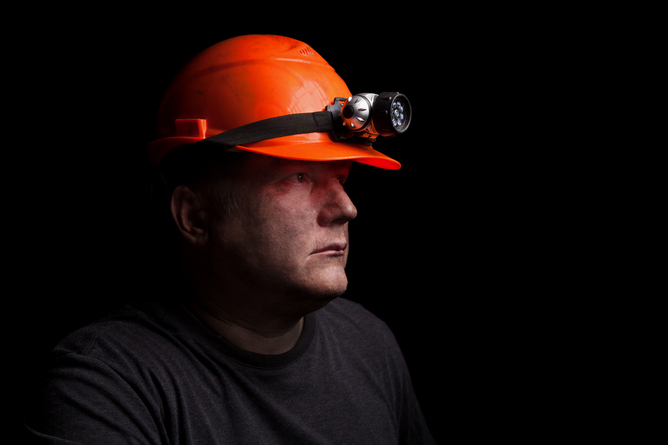 With the mining investment boom coming to an end, a mining production boom will follow. Most of the proceeds of the mining production phase will be exported as profits by largely foreign-owned mining companies or pocketed by the likes of Gina Rinehart and Andrew Forrest. The Australian public owns the resources in the ground that the miners dig up and sell. When we talk about mining income, what we’re mostly referring to is asset sales, not real income. You don’t sell your car and call that money income. The mining companies add value to the resources by digging them up and putting them on a ship in an accessible form but they do not create the value of the resources themselves. Yet it is primarily the mining companies that benefit from high resource prices, rather than those who own the resources (Australian citizens). This is the very definition of economic rent; it is profit that the companies do nothing to earn which is in excess of industry expectations. Australian citizens deserve a reasonable return for selling their assets to the mining companies and a well-designed resource rent tax would deliver that return. This revenue could be placed in a sovereign wealth fund, similar to Norway’s, the proceeds of which could assist with paying pensions or be used to maintain and improve public services such as education and health. The one-off sale of assets should be invested in the future in some way, rather than just be used to plug holes in the budget of the present day. Of course, resource taxation is just one of the many possibilities for increasing tax revenue. The Henry Tax Review, completed in 2009, is full of very sound recommendations, 95% of which have been completely ignored by both Labor and the Coalition. Land taxes are another good option, as is a financial transaction tax. Even increasing the GST is a viable option assuming adequate compensation for low income earners is included as part of the package. Tax reform is difficult. It takes leadership because there are always losers and losers shout louder than winners – who tend to slink away with their proceeds and quietly hope nobody notices. Is there a major party political leader on the horizon with the sort of courage, honesty and charisma necessary to convince us of the need for tax increases and to resist the inevitable, well-funded backlash? Not that I’ve seen. But for the sake of those baby boomers facing decades of retirement spent in poverty, I hope that one emerges soon. This entry was posted in Inequality, superannuation, tax economics and tagged baby boomers, inequality, Ken Henry, mining, rent-seeking, resource rent tax, superannuation, taxation, The Conversation, wellbeing. Bookmark the permalink.